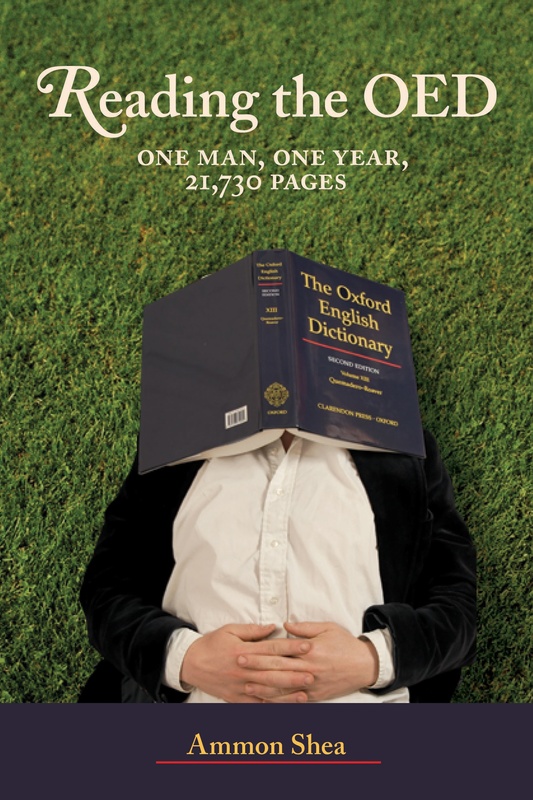 Ammon Shea recently spent a year of his life reading the OED from start to finish. Over the next few months he will be posting weekly blogs about the insights, gems, and thoughts on language that came from this experience. His book, Reading the OED, will be published by Perigee in early July. In the excerpt below from Reading the OED Ammon tells us how it all began. My Oxford English Dictionary arrives at 9:27 one Monday morning, brought by a delivery man who is much cheerier than I would have expected anyone carrying 150 pounds of books up a flight of stairs to be. Five boxes, containing twenty books that promise to take up the next twelve months of my life. I rarely buy books that are brand new, and so I feel almost nervous as I take them out and began removing them in their pristine condition from the plastic wraps. They have a decidedly new-book smell, a scent far more intoxicating to me than that of a new car. After all, you cannot read a car. Of course, I think old books smell just as good as new ones. I arrange them, in order, on the floor along one wall in my living room. They are all dust-jacketed in a dark blue; with a regal and chitinous gloss, resembling the covering of some beautiful and wordy beetle. I sat in an armchair across the room and just stare at them for some minutes. It seems to me that they are glowering on the floor, so I get up and begin making room on the bookshelves. I take a twelve-volume set of the Century Dictionary down and unceremoniously move it to the closet. Then I shuffle a few copies of Webster’s around and place a number of other items on their sides and a few more on whatever surfaces I can find. After about fifteen minutes of arranging, compressing, and stacking books I’ve made enough room to put nineteen of the twenty volumes of the OED away. I leave the first one (A – Bazouki) by the armchair and go to make myself a strong cup of coffee. I drink the coffee and then sit down to begin reading. Almost immediately the simultaneous pleasures and frustrations of dictionary reading become apparent again. First and foremost, the OED is a great read. The definitions are usually beautifully written and there is a palpable sense of the massive amount of human thought and learning that was required to put this work together. The history of English seeps into your head as you read through not just the words and their definitions, but also their etymologies and the way in which they have been used by writers over the centuries. I find myself subject to the entire range of emotions and reactions that a great book will call forth from its reader. I chuckle, laugh out loud, smile wistfully, cringe, widen my eyes in surprise, and even feel sadness – all from the neatly ordered rows of words and their explanations. All of the human emotions and experiences are right there in this dictionary, just as they would be in any fine work of literature. They just happen to be alphabetized. I keep paper and pen by my chair so that I can write down the things in the dictionary that I find interesting. After the first hour I realize that I’ve been writing down far too much, and that if I continue taking notes at this rate I’ll never finish reading. But there is just so much in the dictionary that I wish were in my head, and I read with the constant knowledge that I’m passing by things that later I’ll want to know. The answers to questions that I’ve had for years and the answers to questions that I never knew I had are coming up constantly. These are some of the pleasures of reading the dictionary, and they are indeed sublime. The frustrations are considerably more pedestrian. After the first three hours of reading I had the kind of headache that makes life feel unfair. It is a pounding that keeps pace with my heartbeat, as though I had a second heart, located in the lower-left back part of my head, the sole purpose of which is to pump tiny spasms of pain, rather than blood. I see better out of my left eye than my right, and I spent so much time squinting as I read that I find myself squinting at other times as well. The OED uses different typefaces for different things: The headwords are written in bold, the definitions are in a regular font, the etymologies are in some sort of italicized shorthand, and the citations are written in a smaller type than the rest. Having to constantly make adjustments in my vision, albeit minor ones, is one of the main causes of the headaches. All day long I’m plagued by that feeling that I can’t quite remember a word. This is the first thought in my head every morning when I wake. It is often the last thing I think about before I fall asleep. I read for eight or ten hours each day. Sometimes it is meditative, and my reading assumes a pleasant rhythm for long stretches. At other times it feels maddeningly dull, and I suddenly realize that for the past hour I’d been scanning pages with my eyes but not really reading anything at all, and have to go back to where I had lost attention. Somewhere in the neighborhood of avenge I have an alarming spell for several hours when my vision suddenly turned gray and stays that way for several hours. I find myself doubting this somewhat absurd enterprise, and wonder whether it really is worth reading the whole thing. I remind myself of the marvelous reply that the British mountaineer George Mallory gave to the New York Times in 1923 when asked why he wanted to climb Mt. Everest: “Because it’s there.” Unfortunately, Mallory died during his attempt to climb the mountain, and while I have no illusions that my attempt will be nearly as perilous or dramatic as his, I can sympathize with his reasoning. The nineteen remaining volumes of the OED are there, sitting on my bookshelves, and if I give up reading now I know that I will forever wonder what is in them. After my vision returns to normal I decide that what I need is a magnifying glass. I dig out the magnifier that comes with the compact edition of the OED (the malicious version that has 4 condensed pages of text on each page of paper) and began reading again. It does not work as I intended it to. Its partial success at magnifying the text pales in comparison to its complete success in bringing back my headaches and squints. My friend Peter suggests that I buy myself an overhead projector, so I can put a screen up on the wall and read the books on it. This is a tremendously appealing thought, and I imagined myself reading the OED as if it were a movie. But when I look into getting one I find that the affordable models require one to place the book face down on the machine, meaning that I would have to pick the book up and turn it over, flip a page, and then place it back down – more than ten thousand times. This seems impractical. I reluctantly decide that the OED is meant to be read unencumbered by technology. And so that is how I read it, helped along by a cup of espresso once every hour or so. After eight days, when I finally reach azymous (adj. – unleavened), I feel a shiver of pleasure and relief; not because I think it an interesting word, but because it is the last word in A, which means I was starting to make some progress.